By now, you’ve all seen the BlackBerry Z10. The next big smartphone by Research In Motion has leaked all over the place, but what about the X10, the second, full QWERTY device that RIM is expected to bring? We do know a little bit about it, but it hasn’t leaked in the same vast amount as the Z10. Now, however, Martin Hajeck has taken on the task of fixing that with an extensive set of realistic renders. Now, those are not real images, don’t get fooled. But they do look close to what reality might bring. They are based on pictures of the X10 that surfaced in December. Take a look at the renders below and let us know - would you buy the BlackBerry X10 if it looked like that? The full touchscreen Z10 looks better, this one kinda looks like Bold 9900. Back cover pops open. You ever had experience with such phones or you're 9? I know there is a market for physical keyboards....I seriously think once you got a good screen and keyboard software...physical keyboards wont be needed. Ppl adapt. There are less n less Android phones with a physical keyboard. iPhone grew so big without a physical keyboard. There are former BB users using Android and iPhone...and WP. Some went back to BB...some didnt. I'm all for choices tho. That sure is a big forehead. 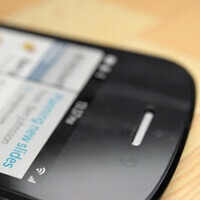 It looks like a LG Nexus 4 with a QWERTY keyboard. That is not necessarily a bad thing. The back design is just eh, prefer the back design on the 9900, but the front of the device isn't too bad, I'm excited to see this in person.